Enter the new Exclaim! Contest for your opportunity to Win an Xbox One X ‘Fallout 76’ Bundle and 12 Months of Xbox Game Pass. This contest is open only to legal residents of Canada (with the exception of Quebec). To enter you need to visit the official competition web page and complete the online entry form with all the requested details including your name, last name, email address, mailing address, city, province, postal code, phone number, age and your answer to the question “A Toronto indie rocker was involved with an anticipated game, now available via Xbox Game Pass. What is his name and what is the game?”. Contest ends at 10:00 am on January 21, 2019. Winner will be selected at random from all eligible entries. 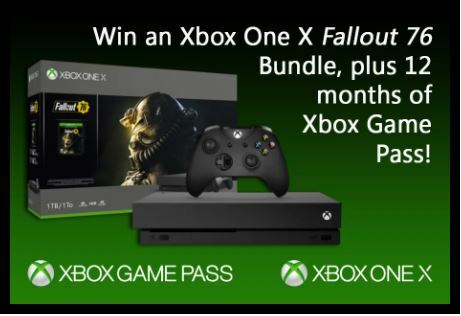 There is one Grand Prize available to be won, consisting of an Xbox One X 'Fallout 76" bundle and 12 months of Xbox Game Pass. The Exclaim! Contest begins at 3:00:00 PM Eastern Standard Time ("EST") on Dec 19, 2018 and ends at 10:00:00 AM on Jan 21, 2019. The draw will take place on January 21, 2019. Winner will be notified by phone or email.